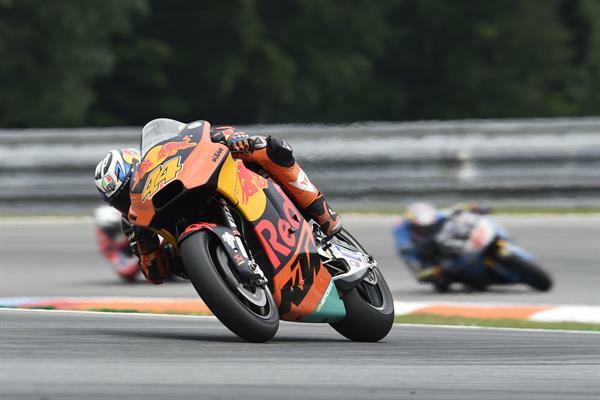 KTM Motorsport Director Pit Beirer had a target for the Red Bull KTM Factory Racing MotoGP team to get a top ten finish in the second half of the 2017 season, and that was achieved today at Brno with Pol Espargaro gaining a brilliant ninth position. All riders had to change motorcycles as the race had started under wet conditions but the strength of the summer sun soon made a dry line appear. Once on the a bike with dry settings and slick tyres, he bravely pushed on and but for a run off-track lost him around six seconds, he may well have been even higher at the flag, but before the team go into their home race on the Red Bull Ring in Spielberg next weekend today has been a great result. 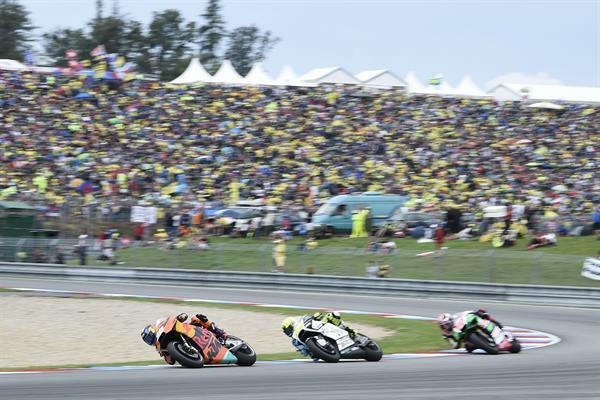 Espargaro also set his fastest lap time just 0.9 secs off the fastest lap of the race. All these results have lifted the team enormously as on going technical progress is made and the KTM RC16 motorcycle edge further up the results sheets. 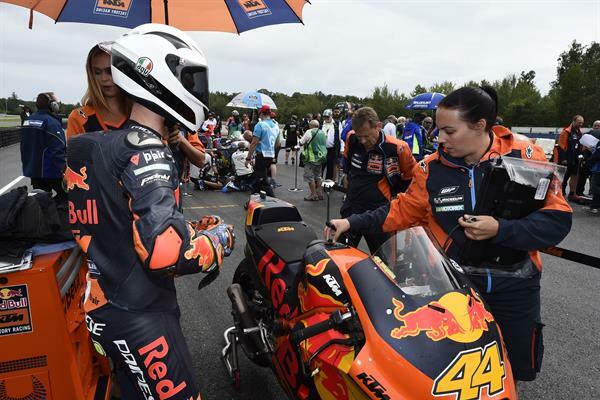 Team mate Bradley Smith rode equally as bravely once on the 'dry bike' but didn't quite have any luck as he had a technical problem with the bike with just one lap remaining that prevented him seeing the chequered flag. 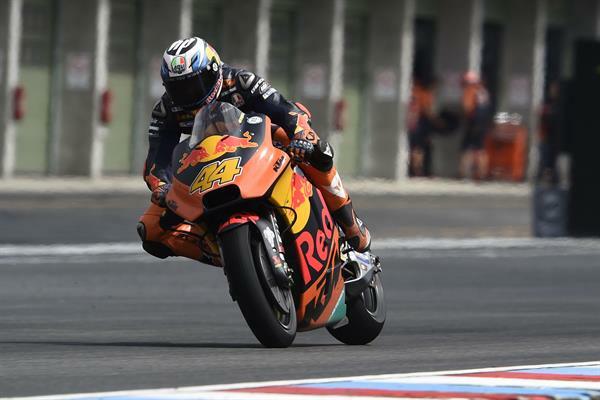 Espargaro: "I am super happy for the team and everyone involved in this MotoGP project. 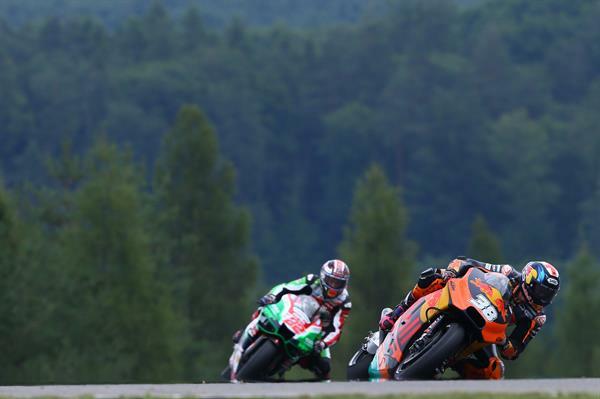 Remember we started our first race in Qatar ten races ago and we finished; then we got points in Argentina and now we get a top ten in August at Brno. It's real today! After I changed bikes I made a mistake and lost six seconds going through the gravel, but away from that we've done a super job this weekend. I'm happy that I rode well this weekend but the team have done such an outstanding job. The bike is so good on the brakes but we're still missing something on the cornering but here today with what we have after ten races it was working very well. After the recent tests we can all feel the difference and upward direction in the level of the bike. In fact, we thought that after the test Mika (Kallio) had here we thought we would struggle a bit here but with what we did at Aragon it's meant the bike is so much better already. I'm riding the bike differently and more effectively and that is making the combination a tighter package. Now to Austria: Can't wait." Smith: "These conditions make it very difficult and stressful for the whole team as it doesn't make it easy with so many different scenarios and so many ways to react. We had a long bike change after lap two but so soon after the start it doesn't give the crew a lot of time (to change the bike settings) but then later on the race wasn't going in its best direction only for the bike to have a problem so I decided it was better to save the bike and stop. What I do want to do is to congratulate the whole team on their first top ten; it's a huge amount of work from everybody. First of all, Pol is riding so he takes the majority of the credit but it's a huge team effort from not only here at the track but from the test team and everybody back at KTM Motorsport in Austria. So, a frustrating way to end the weekend as there have been many positives in the rain and also in the dry yesterday afternoon but we weren't quite able to show it today. Having said that, I'm looking forward to a full day of testing tomorrow here at Brno to work on something ready for the team's home Grand Prix in Austria next weekend." Pit Beirer (KTM Motorsport Director): "I'm extremely happy with this special moment because this was a target for us to get into the top ten in the first season and even if it was a big target, it's now a reality. We've felt over the last races that we made steps, and then from the last test we made another step...but you only have it proven in a race, today being the point where you could see we made that step on a very difficult track for us. It's a two minute track here in Brno, but we knew we were competitive over the whole weekend and we knew we could race some of the top guys, so this is not a lucky punch as we fought hard for it. We made many passes from the start of the race so it's been a big payback for the team, the engineers and all the staff back at base in Austria. I think this has proven we're in the right direction but I can promise everyone we cannot and will not stop at his level." 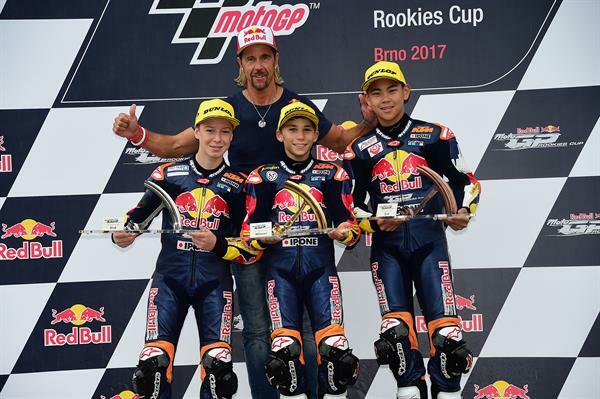 Mike Leitner (Team Manager MotoGP): "It was our target at the beginning of the year to at one time touch the top ten so to achieve that at the first race after the summer break is such a boost for the team, for the riders and for the belief in the project so it's unbelievable. I mean I think everybody who works on the MotoGP project is really super happy and it's really nice to see it working out. Things were very happy today on Pol's side of the garage while we feel for Bradley's side as it didn't work out in the way we expected, but races like today's usually see one rider in a good position as many things can happen. We now look forward to the home race for the team next weekend at Spielberg where there will be so many KTM staff with their families from the motorsport and production side of this amazing company. It is with their work and support that can enable us to push for results such as this today." 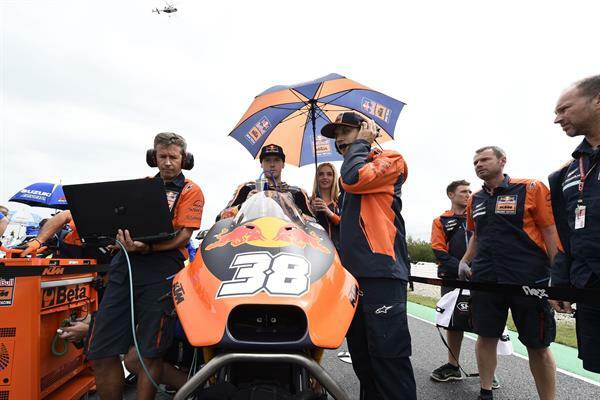 Miguel Oliveira once more returned to the Red Bull KTM Ajo garage with a bottle of champagne in his hand following third place in a damp Moto2 race. 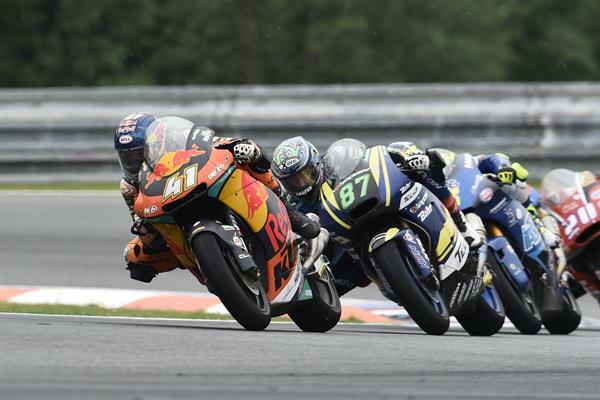 His result today now makes it five podiums from ten races for the KTM Moto2 motorcycle. Importantly today has shown that the motorcycle is now quick in the wet as well as the dry as it has been to the top of every session at Brno. 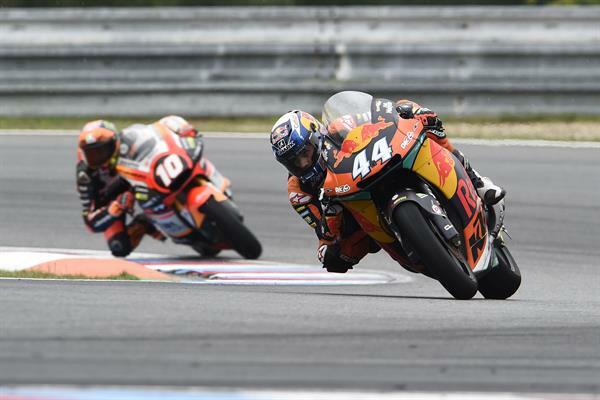 Team mate Brad Binder had a good day, even if the results sheets didn't show it. He easily ran in 7th during the second part of a rain interrupted race but saw them chequered flag in 12th. 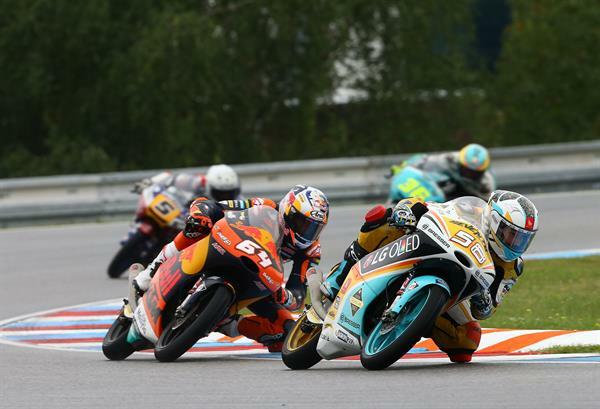 The Moto3 World Champion reflected on the weekend as his best so far in Moto2 after a top ten qualifying position. Oliveira: "It was a very difficult race. We were lucky that it was short, because at the end it was very tricky when the rain fell again. In any case, I was able to make a good start, although in just half a lap, Luthi and Marquez pushed hard and I lost contact with them. I was also fighting with the riders behind and I think I lost a little time with that. Later I was able to cut the gap, but I needed a few more laps. It was a very difficult race, I couldn’t do any better than third. I am pleased that we were able to improve in these wet conditions because we were not able to do so in some of the previous races. I'm very happy." Binder: "Honestly, in the dry race I felt really good. I knew that if I could keep with the riders at the front during the first five laps I could start to go faster, because with a full tank it was much more difficult. When I latched onto the lead group again I was confident, but then it started to rain and they stopped the race. It was a little disappointing because I had the leader right in front of me. I was only one tenth off the fastest lap of the race. I have worked very hard this weekend and twelfth position is not enough for me. The good part is that in the second race I felt good in the rain at first, although contact with another rider made me lose time and go wide. I kept pushing, but I didn’t do it in the right places. The positive thing is that I learned how to handle a Moto2 bike in rainy conditions, because without a doubt I had made many mistakes earlier this season. I am happy; these are not the results that I expected but we will continue working. I think overall it's been a very good weekend, the best since I've been in Moto2. I'm sure we can find a way to get to the front." Aki Ajo (Team Manager Moto2): "It has been a very good weekend for us in Moto2. Our riders have had a good performance in both dry and wet conditions. Unfortunately Brad (Binder) didn’t feel comfortable in the second race. But for me it has also been a good weekend for him. For Miguel (Oliveira) it has been a very positive weekend, especially with his podium, but also because he managed to be up there in every session. In my opinion, one of the most important things that we take from this GP is that we were strong in wet conditions, when we had not been previously. So we have taken a new step forward." 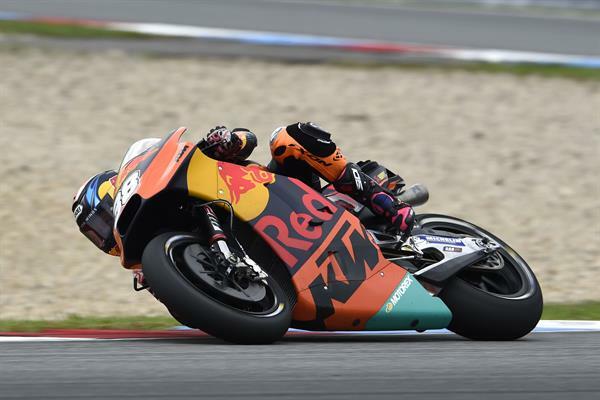 Following Gabriel Rodrigo's first ever pole position with the KTM RC250 GP in Moto3 yesterday, things were looking up for KTM in the Moto3 race today with him fighting at the front before Red Bull KTM Ajo's Bo Bendsneyder took the lead in a tremendous battle. 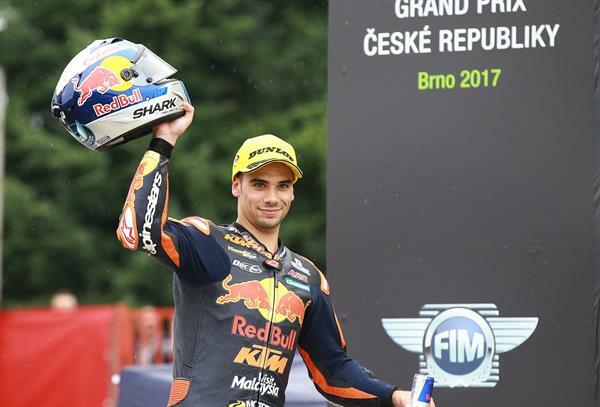 As cut slick tyres were used by all in drying conditions, Bendsneyder had a huge fight for third on the last lap only to be narrowly pipped to the podium. He was the leading KTM home and was congratulated afterwards by team boss Aki Ajo on his improvements and growing mental strength in recent races. 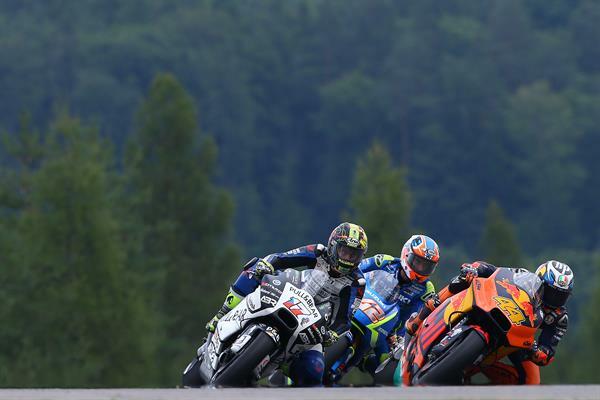 Bendsneyder: "Today's race was very difficult. The most positive thing is that the whole weekend went very well. We were competitive in all kinds of conditions. Unfortunately we finished fourth, when we had been fighting the whole race to be on the podium. The problem in the race was that on the last few laps, when the track was drying out, other riders came through at a better pace than us. It is not only a question of the bike, but also of the rider. I think this was the problem that meant we couldn’t follow them on the last two laps. In short, I gave my all, I finished fourth but in the end I think it has been a very positive weekend." 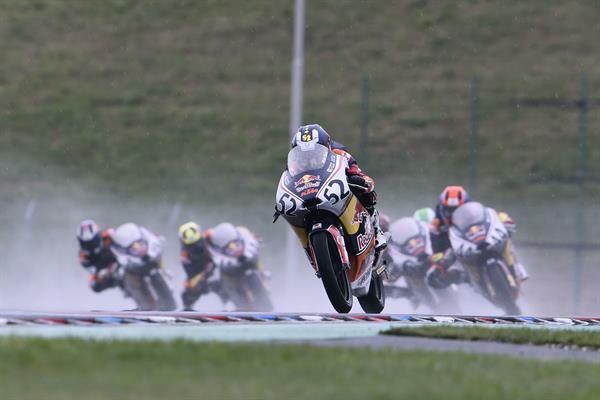 Rain master Deniz Öncü took his second Red Bull MotoGP Rookies Cup victory of the season as twin brother Can slid out of a handsome lead on lap 5 of 9 at a soaking wet Brno. 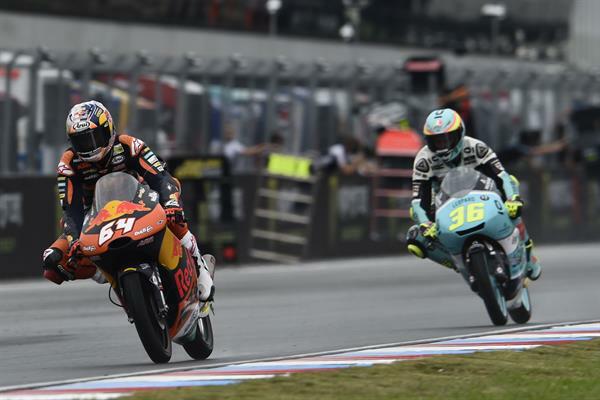 The Turkish 14-year-old rode superbly to hold off German 17-year-old Kevin Orgis who had cut through from last place on the grid. 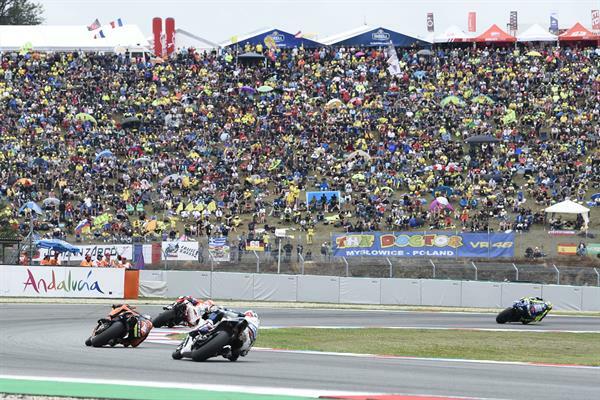 Ryusei Yamanaka, the 15-year-old Japanese, took a thrilling third as fellow countryman Ai Ogura slid off on the final corner trying to beat him to the line. 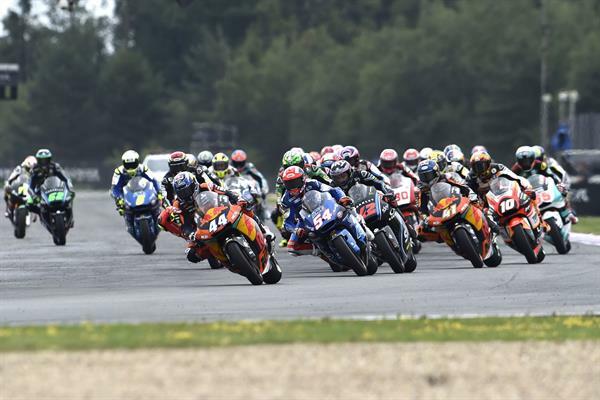 That completed another fabulously unpredictable weekend of KTM RC250 RB action and closed the points battle with second place man Aleix Viu crossing the line seventh thus cutting Can Öncü’s points lead to 17.